The next chapter discusses objects and object classes. Namespaces are discussed later in this book. Each Caché class has a name, which must be unique within the namespace where it is defined. A full class name is a string delimited by one or more periods, as in the following example: package.subpackage.subpackage.class. The short class name is the part after the final period within this string; the part preceding the final period is the package name. This book does not discuss projects in any detail; for information, see Using Studio. Studio provides options for exporting individual classes, entire packages, and projects to XML files, as well as for importing those items from XML files. Parameters  A parameter defines a constant value for use by this class. The value is set at compilation time. Methods  There are two kinds of methods: instance methods and class methods (called static methods in other languages). In most cases, a method is a subroutine. Properties  A property contains data for an instance of the class. Class queries  A class query defines an SQL query that can be used by the class and specifies a class to use as a container for the query. XData blocks  An XData block is a well-formed XML document within the class, for use by the class. These have many possible applications. Other kinds of class members that are relevant only for persistent classes; these are discussed in the next chapter. A class definition can include keywords; these affect the behavior of the class compiler. You can specify some keywords for the entire class, and others for specific class members. These keywords affect the code that the class compiler generates and thus control the behavior of the class. The first line gives the name of the class. MyApp.Main.SampleClass is the full class name, MyApp.Main is the package name, and SampleClass is the short class name. You cannot edit the class name. (If you do, your changes are ignored, and the original class name is shown when you next open the class definition.) For information on renaming a class, see Renaming a Class, later in this book. Extends is a compiler keyword. The Extends keyword specifies that this class is a superclass of %RegisteredObject, which is a system class, discussed in the next chapter. This class extends only one class, but it is possible to extend multiple other classes. Those classes, in turn, can extend other classes. CONSTANTMESSAGE is a parameter. By convention, all parameters in Caché system classes have names in all capitals. This is a convenient convention, but you are not required to follow it. The Internal keyword is a compiler keyword. It marks this parameter as internal, which suppresses it from display in the class documentation. This parameter has a string value. VariableMessage and MessageCount are properties. The item after As indicates the types for these properties. InitialExpression and Required are compiler keywords. HelloWorld() is a class method and it returns a string; this is indicated by the item after As. This method uses the value of the class parameter. WriteIt() is an instance method and it does not return a value. This method uses the value of the class parameter and values of two properties. The ServerOnly compiler keyword means that this method will not be projected to Java or C++ clients. The reference is within a class, and the referenced class is in the same package or subpackage. The reference is within a class, and the class uses the IMPORT directive to import the package or subpackage that contains the referenced class. The reference is within a method, and the method uses the IMPORT directive to import the package or subpackage that contains the referenced class. You are referring to a class in the %Library package, which is specially handled. You can refer to the class %Library.ClassName as %ClassName. For example, you can refer to %Library.String as %String. You are referring to a class in the User package, which is specially handled. For example, you can refer to User.MyClass as MyClass. InterSystems does not provide any classes in the User package, which is reserved for your use. To define a value that should not be changed at runtime. 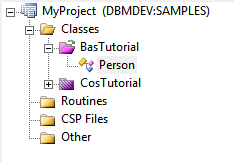 To customize the behavior of the various data type classes (such as providing validation information) when used as properties; this is discussed in the next section. To provide parameterized values for method generator methods to use. A single, literal value, usually based on a data type. An object value (this includes collection objects and stream objects, both introduced in the next chapter). A multidimensional array. This is less common. The word property often refers just to properties that are attributes, rather than properties that hold associations. Relationships, which hold associations between objects. In each definition, the item after As is the type of the property. Each type is a class. The syntax As List Of is shorthand for a specific collection class; these are discussed in the next chapter. %String, %Date, and %Numeric are data type classes. %String is the default type. Diagnoses is a relationship property; the rest are attribute properties. PatientID, Gender, BirthDate, and Age can contain only simple, literal values. PatientID is required because it uses the Required keyword. This means that you cannot save an object of this class if you do not specify a value for this property. Age is not saved to disk, unlike the other literal properties. This is because it uses the Transient keyword. MyTempArray is a multidimensional property because it uses the MultiDimensional keyword. This property is not saved to disk by default. PrimaryCarePhysician and Allergies are object-valued properties. The Gender property definition includes values for property parameters. These are parameters in the data type class that this property uses. This property is restricted to the values M and F. When you display the logical values (as in the Management Portal), you see Male and Female instead. Each data type class provides methods such as LogicalToDisplay(). Object-valued properties and relationship properties are discussed in the next chapter. Specifies that the value of the property set before an instance of this class can be stored to disk. By default, properties are not required. In a subclass, you can mark an optional property as required, but you cannot do the reverse. Specifies an initial value for the property. By default, properties have no initial value. Subclasses inherit the value of the InitialExpression keyword and can override it. The value specified must be a valid ObjectScript expression (this applies even if the class is written in another language, such as Caché MVBasic). Specifies that the property is not stored in the database. By default, properties are not transient. Subclasses inherit the value of the Transient keyword and cannot override it. Specifies that the property is private. Subclasses inherit the value of the Private keyword and cannot override it. By default, properties are public and can be accessed anywhere. You can mark a property as private (via the Private keyword). If so, it can only be accessed by methods of the object to which it belongs. In Caché, private properties are always inherited and visible to subclasses of the class that defines the property. In other programming languages, these are often called protected properties. Specifies that the property has no in-memory storage allocated for it when the object containing it is instantiated. By default, a property is not calculated. Subclasses inherit the Calculated keyword and cannot override it. It does not have associated methods (see the following topics). Multidimensional properties are rare but are occasionally useful to temporarily contain object state information. When you define a property and you specify its type as a data type class, you have special options for defining and working with that property, as described in this section. Data type classes enable you to enforce sets of rules about the values of properties. Caché provides data type classes which include %Library.String, %Library.Integer, %Library.Numeric, %Library.Date, %MV.Date, and many others. Because the names of classes of the %Library package can be abbreviated, you can abbreviate many of these; for example, %Date is an abbreviation for %Library.Date. It provides a set of methods to translate literal data among the stored (on disk), logical (in memory), and display formats. /// The maximum number of characters the string can contain. When you define a property and you specify its type as a data type class, you can override any parameters defined by the data type class. For this property, the maximum allowed value is 10. Similarly, every property of type %String has a collation type, which determines how values are ordered (such as whether capitalization has effects or not). The default collation type is SQLUPPER. For more details on collations, see the section Data Collation in the chapter Caché SQL Basics in Using Caché SQL. This directly sets Carl as the in-memory value of the property Name, bypassing the NameSet accessor method (if present). The variable i%Name is an instance variable; see i%<PropertyName> syntax in Using Caché Objects. For information on accessor methods, see see the chapter Using and Overriding Property Methods in the same book. Properties have a number of methods associated with them automatically. These methods are generated by the data type classes. where IsValid is a method of the property class and LogicalToDisplay is a method of the %Date data type class. There are two kinds of methods: instance methods and class methods (called static methods in other languages). In most cases, a method is a procedure. In this case, the variables in this method would be public variables. You have the choice of implementation language when creating a server-side method in Caché. The options are basic (Caché Basic), cache (ObjectScript), mvbasic (MVBasic), and tsql (TSQL). By default, a method uses the language specified by the Language keyword specified for the class. In most cases, that keyword is cache (ObjectScript). Specifies that the method is private. Subclasses inherit the value of the Private keyword and cannot override it. It can only be accessed by methods of the class to which it belongs. It is, however, inherited and available in subclasses of the class that defines the method. Other languages often call such methods protected methods. Note that you cannot use this syntax within a class method to refer to an instance method. This is known as Caché dot syntax. Not all methods have return values, so choose the syntax appropriate for your case. Within an instance method, sometimes it is necessary to refer to the current instance itself, rather than to a property of method of the instance. For example, you might need to pass the current instance as an argument when invoking some other code. In such a case, use the special variable $THIS to refer to the current instance. A method can take positional arguments in a comma-separated list. For each argument, you can specify a type and the default value. Notice that two of the arguments have explicit types, and one has an default value. Generally it is a good idea to explicitly specify the type of each argument. The ByRef keyword indicates that you should pass this argument by reference. The Output keyword indicates that you should pass this argument by reference and that the method ignores any value that you initially give to this argument. Similarly, when you define a method, you use the ByRef and Output keywords in the method signature to inform other users of the method how it is meant to be used. The ByRef and Output keywords provide information for the benefit of anyone using the InterSystems Class Reference, introduced later. They do not affect the behavior of the code. It is the responsibility of the writer of the method to enforce any rules about how the method is to be invoked. Because methods are procedures, they support the ... syntax to accept variable numbers of arguments. This syntax is described in the Variable Numbers of Arguments section of the User-defined Code chapter of Using Caché ObjectScript. When a method is invoked, it uses its default values (if specified) for any missing arguments. This technique, however, does not affect the class signature. where Label^Routine specifies a label within a routine. A method generator is a program that is invoked by the class compiler during class compilation. Its output is the actual runtime implementation of the method. Method generators provide a means of inheriting methods that can produce high performance, specialized code that is customized to the needs of the inheriting class or property. 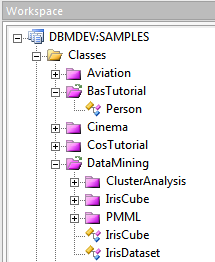 Within the Caché library, method generators are used extensively by the data type and storage classes. For details, refer to the Method Generators chapter of Using Caché ObjectScript. You define class queries to provide predefined lookups for use in your application. For example, you can look up instances by some property, such as by name, or provide a list of instances that meet a particular set of conditions, such as all the flights from Paris to Madrid. The example shown here uses a parameter, which is a common way to provide a flexible query. Note that you can define class queries within any class; there is no requirement to include class queries within persistent classes, which are introduced later in this book. In Zen pages, you use XData blocks to describe the look and feel of the page. 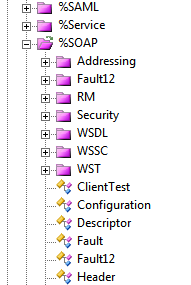 WS-Policy support for Caché web services and web clients. See Creating Web Services and Web Clients in Caché. In this case, an XData block describes the security policy. In DeepSee, you use XData blocks to define cubes, subject areas, KPIs, and other elements. Note that in all these cases, the XData block must be included within a class of a specific type. Then your methods in that class can refer to any macros defined in that include file, or in its included include files. Macros are inherited. That is, a subclass has access to all the same macros as its superclasses. As with other class-based languages, you can combine multiple class definitions via inheritance. A Caché class definition can extend (or inherit from) multiple other classes. Those classes, in turn, can extend other classes. The following subsections provide the basic rules for inheritance of classes in Caché. By default, if a class member of a given name is defined in multiple superclasses, the subclass takes the definition from the left-most class in the superclass list. If the class definition contains Inheritance = right, then the subclass takes the definition from the right-most class in the superclass list. For reasons of history, most Caché classes contain Inheritance = right. Any class that extends other classes has a single primary superclass. No matter which inheritance order a class uses, the primary superclass is the first one, reading left to right. For any class-level compiler keywords, a given class uses the values specified in its primary superclass. For a persistent class, the primary superclass is especially important; see Classes and Extents, later in this book. Although an object can be an instance belonging to the extents of more than one class  such as that of various superclasses  it always has a most-specific type class (MSTC). A class is the most specific type of an object when that object is an instance of that class, but is not an instance of any subclass of that class. A class inherits methods (both class and instance methods) from its superclass or superclasses, which you can override. If you do so, you must ensure that the signature in your method definition matches the signature of the method you are overriding. This even includes that any argument of a subclass’s method cannot have a data type specified if the matching argument of the superclass’s method has no data type specified. The method in the subclass can, however, specify additional arguments that are not defined in the superclass.